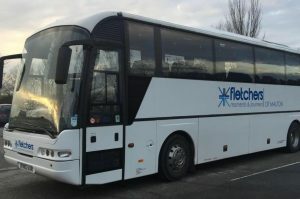 Fletcher’s Coaches is a friendly, popular, family-run company based in Malton, Yorkshire. Their customers enjoyed a day-trip to the Forest of Dean and Wye Valley. Their guide met them at Chepstow where they had good views of Chepstow Castle and the River Wye. They travelled up and up, and up the twisty road to to Wyndcliffe Court where they enjoyed “elevensies” in the tea room set in a sculpture garden. A highlight of all Fletcher’s tours is the presence of Charlie, the famous white Scottie dog, who accompanies the driver on all the tours. This well-travelled doggy was delightful company for all, including the guide.